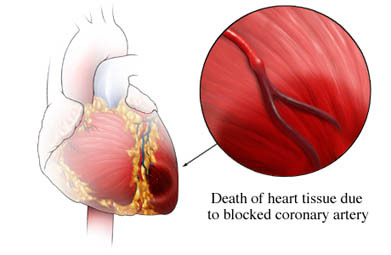 A heart attack is due to a blockage of blood flow to an area of the heart. The heart tissue becomes damaged or dies within a short time after blood flow is stopped. If a large or vital area is affected the damage may stop the heart. Blockages may only last a short time and then allow some blood flow. Others may last longer, and lead to more damage. The risk of heart attack is greater in males and older adults. Call for emergency services right away if you think you may be having a heart attack. Early care can stop further damage. NSTEMI—It is a partial block of an artery. The block may also allow periods of some blood flow. Blood tests—can show markers in the blood. These markers appear when a heart attack and can show how much damage was done. Echocardiogram —creates images of the size, shape, function, and motion of the heart. Coronary angiography —used to look at coronary arteries. Can help find blockages or damage to the arteries. Stress test —Records the heart's electrical activity under physical stress. May be done days or weeks after the heart attack. Electron-beam computed tomography (EBCT)—Takes images of the heart, coronary arteries, and surrounding area. Aspirin and other antiplatelet agents—to decrease clotting in the blood and improve blood flow. Oxygen therapy—to increase the amount of oxygen in the blood. This will increase oxygen that is available to the heart. Nitrate medications—to help the blood vessels open. It can improve blood flow. Blood thinners –to thin the blood and help to dissolve blood clots. Includes aspirin, aspirin-like medications, and anticoagulants. Beta-blockers and/or angiotensin-converting enzyme (ACE) inhibitor medications—to decrease the workload on the heart. Cholesterol-lowering medications such as statin drugs—may decrease chance of another heart attack or stroke. Medicine may be given to try to break up blood clots. The sooner these medicines are given the better the outcome will be. It works best when given within the first 6 hours after symptoms appear. Balloon angioplasty —A wire is passed through blood vessels to the heart. A balloon is used to open the blocked artery. A stent may also be placed. It will help keep the area open. Coronary artery bypass grafting (CABG)—An open surgery. A part of a blood vessel from another area of the body will be taken. It is used to make a path around the blocked area in the heart. A heart attack can be a major life event. It is common for people to experience depression after having a heart attack. Therapy and medicine can help to manage these challenges. Maintaining a healthy weight . Beginning a safe exercise program . Follow your doctor's advice. Do not smoke. If you smoke, talk to your doctor about ways to quit . Eat a healthful diet . Aim for one that is rich in whole grains , fruits, and vegetables . Look for healthy fats like those found in fish, nuts, and seeds. Manage long-term conditions that can affect the heart. This includes high blood pressure , diabetes, and high cholesterol . Use relaxation techniques to manage stress . Small daily doses of aspirin may help some people decrease their risk. This should only be done with your doctor’s approval. Aspirin can have side effects like bleeding in the stomach. Aspirin may also cause problems with other medicine. About heart attacks. American Heart Association website. Available at: http://www.heart.org/HEARTORG/Conditions/HeartAttack/AboutHeartAttacks/About-Heart-Attacks%5FUCM%5F002038%5FArticle.jsp#.WbhYX7KGNQI. Updated January 27, 2017. Accessed September 12, 2017. Antithrombotic Trialists' (ATT) Collaboration, Baigent C, Blackwell L, et al. Aspirin in the primary and secondary prevention of vascular disease: collaborative meta-analysis of individual participant data from randomised trials. Lancet. 2009;373:1849-1860. Explore heart attack. National Heart Lung and Blood Institute website. Available at: https://www.nhlbi.nih.gov/health/health-topics/topics/heartattack. Updated January 27, 2015. Accessed September 29, 2014. ST-elevation myocardial infarction (STEMI). EBSCO DynaMed Plus website. Available at: http://www.dynamed.com/topics/dmp~AN~T115392/ST-elevation-myocardial-infarction-STEMI . Updated June 12, 2017. Accessed September 12, 2017. 2/3/2014 DynaMed Plus Systematic Literature Surveillance http://www.dynamed.com/topics/dmp~AN~T233244/Testosterone : Finkle W, Greenland S, Ridgeway GK, et al. Increased risk of non-fatal myocardial infarction following testosterone therapy prescription in men. PLoS One. 2014;9(1):e85805. 7/17/2017 DynaMed Plus Systematic Literature Surveillance http://www.dynamed.com/topics/dmp~AN~T116779/Acute-coronary-syndromes : Bally M, Dendukuri N, Rich B, et al. Risk of acute myocardial infarction with NSAIDs in real world use: bayesian meta-analysis of individual patient data. BMJ. 2017;357:j1909.